Method Laundry Detergent Packs is all about being eco-friendly and biodegradable. It currently has a 4.4 star rating on Amazon, and carries the badge for "Amazon's Choice". However, there are some chemicals to be found with this brand. Now whether or not those chemicals are still safe or not will be the deciding factor into whether or not this product is worth your money. First impressions are important. And what I got from Method Laundry Detergent Packs is that they really care about the environment and keeping it safe. In addition, they also care about telling you exactly what is in their product. why it is included, and where it comes from. Companies that are transparent about their ingredients and other information inspire a lot of confidence because they are showing that they have nothing to hide. 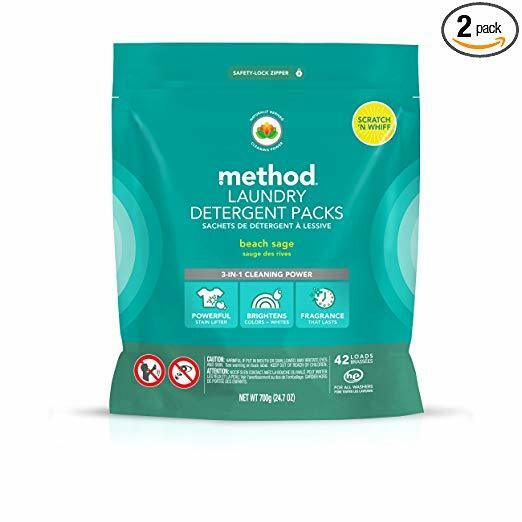 While people may not want to choose this brand because they are in pod form, Method Laundry Detergent Packs makes sure that you know that there is nothing to worry about with their product being harmful to the environment. The best quality of Method Laundry Detergent Packs is that they are super transparent about their ingredients. While the majority of them are in fact natural and naturally sourced, there are a few that are chemicals. However, they do avoid any use of phthalates, phosphates, chlorine, dyes, and other harsh chemicals. The key ingredients are a combination of naturally derived surfactants and chemical based cleaners and brighteners, but there are no harsh or potentially harmful chemicals listed. Even the fragrance, which in this case is beach sage, is mostly essential oils, with trace amounts of safe synthetic fragrances. Each and every one of their ingredients are biodegradable, which seems to be their main focus, rather than natural ingredients. If you take a look at either their web page or the back of their bag, they put the source and role that each and every ingredient has in their laundry detergent. Honestly, even though it may not be 100% natural, just the fact that they are honest gives them huge brownie points in my book. While a scent is not particularly needed when it comes to laundry detergents, it is definitely welcome. Many people believe that if your clothes do not come out smelling like flowers or citrus, that means they are not clean. This is not true in the least, but because it has been ingrained in our minds for so long, it is still a good idea to use a fragrance in your detergent, from a business standpoint. So, Method Laundry Detergent Packs does include a scent, but it is not overpowering as other natural detergents can be. While not all chemicals are avoided in this product, the focus is on biodegradability. A focus that they do a very good job of upholding. Every single ingredient is biodegradable readily. Even their packaging is made from recycled plastic and their pods are dissoluble as well. This means that nothing in the Method Laundry Detergent Packs is potentially harmful to the environment, or to your body. When it comes to buying detergent, the cheaper the better. Unfortunately, Method Laundry Detergent Packs are decently priced. This pack gives you about 40 loads worth of detergent pods. For the price, you can typically get more out of a powder detergent, but considerably less from a liquid. So the pods do make the detergent more efficient than the liquid, but probably less than the powder. While the price is a great factor, often times the packaging itself seems to be problematic. I’ve never personally had a problem, but I have read quite a few reviews where people have stated that they have had their products arrive with the liquid leaking all over the place. Often times, it was packaged with multiple other items, and the detergent had leaked all over them, some ruining the other items it came with. Now, many of the complaints were about the liquid alternative for this product, and not the pods. So I expect that the pods are a bit safer to ship, because the detergent is packaged individually in the bag. But I would still be careful. While the main thing with detergent is meant to just clean your clothes, some do a better job than others. Unfortunately for the Method Laundry Detergent Packs, they do not seem to be as effective as the liquid alternative from the same brand. Method as a business seems to be extremely environmentally conscious. Everything they do, furthers the efforts of being eco-friendly and creating a better environment. Whether that be in being a B corporation, not testing on animals, or using energy conscious practices including buying RECs and offsetting carbon emissions, all of their efforts are to make the world a better place by not adding to the pollution and greenhouse gas emissions. They even get all of their resources and ingredients from sustainable sources, and invest in renewable and recyclable options. Method Laundry Detergent Packs is entirely biodegradable. When you use Method, you won’t be adding harmful chemicals to the environment or your septic tank. If you are looking for a trustworthy brand with nothing to hide, look no further than Method Laundry Detergent Packs. All of their ingredients are listed, as well as their roles and sources. This company is solely focused on bettering the environment by being eco-friendly in all of their practices. These include greensourcing, choosing fuel efficient shipping methods, reducing energy when they can, and being cradle to cradle certified. There are a handful of chemicals that are included in this product. However, each and every one is still readily biodegradable and do not pose any potential risks to you. Pods may not be as effective as regular liquid. The biodegradability and transparentness of Method Laundry Detergent Packs is extremely impressive. While not all of the ingredients are natural, they are honest and upfront about what is included in this product. If you are looking for an honest and eco-friendly brand to get your detergent from, this is probably the brand for you. However, the pods may not be the most effective choice. So that is something to take into consideration. Overall, Method Laundry Detergent Packs are not entirely great. The chemicals that these do contain will be a deal breaker for some people, along with the price. However, they are extremely eco-friendly and every ingredient is biodegradable and their packaging is even made from recycled plastic, which is a big advantage. So if you want to try these pods out for yourself, you can grab a 2 bag combo on Amazon for $32.75. For more information, including the best natural laundry detergent, check out the rest of Green and Growing. Here are some top questions that I found for people seriously considering buying the Method Laundry Detergent Packs. What is made from the recycled plastic? Both the bag and the pods.